We love our "Ted Williams" table! We have received many compliments! Adds unique character and warmth to our dining room. Can't wait to put the leaves in! Thank you for my beautiful, beautiful custom desk and file cabinet created out of a vintage box. The design and finishes are just what I asked for --barnwood/driftwood grays and browns and look perfect in my home office! Truly stunning. This makes working so much more enjoyable-- I actually find myself still going into the office just to look at the pieces and admire them. And I brought them home a month or more ago ! This is a desk and file cabinet with character-- I love the swells and knots and texture of the reclaimed wood. What you and your artisans do is pure magic and I couldn't be more pleased. Promise to send along a picture soon. Thank you again for the incredible craftsmanship and artistry. You nailed it (sorry--couldn't resist the pun) ! First piece ! Brings me great pleasure and many compliments. Look what arrived today! Love my new piece! We love the Staples vision and artistry. When we bought our first home 15 years ago we started with 1 small piece, a hay-hook coffee table. It was like a gateway drug! I would see it in the living room and wonder what other cool things Steve was making in his shop. My husband knew if we needed a piece of furniture that would be our first stop. Over the years we have bought numerous pieces from the showroom floor and they are all spectacular. You are not only buying a piece but also the history that goes with the specific elements. What has been truly special though is the few times we worked closely with Steve to make our vision come to life with a luggage cart bookshelf and even a queen sized bed! These are some of my most treasured possessions and I will be passing them down to the next generation with pride. Thanks again for sharing your artistry! We are loving our bar height table you made for us. Meeting both of you to talk about details of making the table to fit our needs reassured us that we were going to get exactly what we were looking for. Then our second visit was when the selected board came in for our inspection and more details of what the process is when Stephen gets to work. This is a great quality table that gets used a lot. Our friends love it. Just wanted to thank you for our wonderful visit on Thursday. My son, Reid was home from Dubai and I wanted to show him your work at the new bookstore in Plainville and to visit your new showroom/workshop in Attleboro. You were all so kind and inviting. 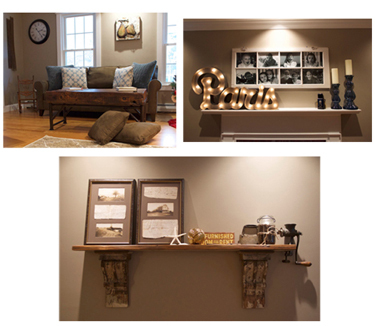 We felt right at home and enjoyed a window into your creative process with reclaiming old treasures into new heirlooms. So impressed with your new digs! Just wishing you the best and can't wait to visit again! 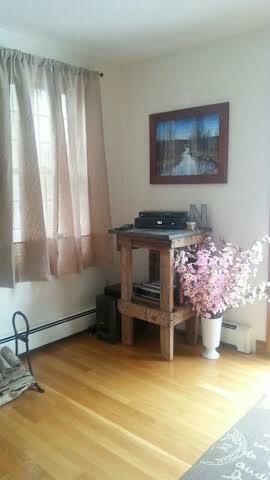 This table fits wonderfully in our living room where our electronic equipment is stored. This piece and many others provide our home with a great rustic/modern feel. We Love our rustic bench! Perfect look for our front entry way Thank you! We have worked with Steven and Chris on a number of items through the years. When we built a house about 10 years ago we went to them to purchase a number of pieces. From our custom made dining room table and chairs, to several cabinets, unique stone coffee table, a couple of custom made mirrors, and even our fireplace mantle! a another vanity from you for a smaller bathroom we are going to do over. Thank you for the perfect bathroom piece! Thank you so very much for the work that you did to create such gorgeous pieces for us. Working with Steve for over a year has truly been a fun and educational experience. Watching you salvage the materials from the old house with such love and care and careful consideration for what each item could become was very inspirational. 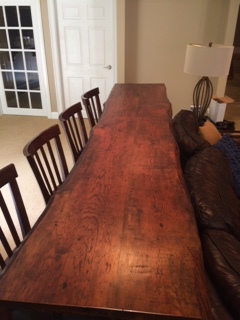 I waited with baited breath to receive the family dinner table that you designed for us from our salvaged wood. Your delivery men had to look at me and ask if everything was ok when I started tearing up at the sight of it! Happy tears, I explained to them. It is simply perfect: well-proportioned, solid craftsmanship and perfectly finished. I have enjoyed showing it off and explaining marriage marks, worm holes and baking the wood in ovens. The smaller table and the three mirrors are all equally special to me and elicit a smile and a gentle rub on the beautiful wood each time I walk past. You were all such a pleasure to work with and my family couldn't be happier with the results. Hearing my kids explain how the pieces are new to us but made from old materials is really fun. This was a very special process and one that I was very thankful to be a part of. THANK YOU! As you know, the table and bench were delivered yesterday (Barb, thank you so much again for going in to open the gallery for the White Glove folks - who were stars by the way). I was the first time I had seen, in-person, the wood since chalking up the boards in the back room of the gallery. I have to tell you that it was (and continues to be) literally breathtaking to look at the finished products. I catch myself staring at the two pieces - and running my hand lovingly over the surfaces of both - every time I am in close enough proximity to reach them. I am truly in awe and humbled by Steve's workmanship and I couldn't be happier with how the pieces turned out. If I were as good at what I do as Steve is at what he does, I would go to sleep each night with a permanently contended smile on my face - I hope he does. You have for sure not seen the last of me (which I realize may be a blessing or a curse for you given how difficult I often am to track down) - but there are many places in my house that could use the kind of beauty and magic that your furniture exudes. Thank you, thank you for putting up with me and for bestowing upon me such a wondrous expression of Steve's craft. 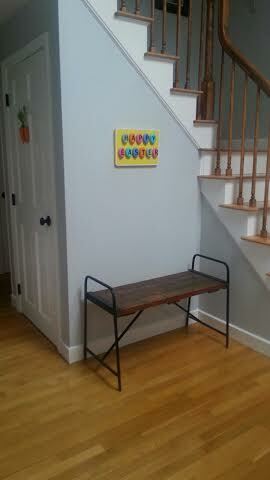 PS - I will send photos "in situ" once I get chairs worthy of my new masterpieces - I promise! I can't tell you how beautiful our table looks in our home and how many compliments we have received on it. Knowing that we picked out the wood and that it was made specifically for us makes it truly special. I just read the article in the November/December 2006 Audubon magazine that highlighted your work. Thank you for taking the gentle approach to creating furniture and helping to save our environment. If I am in need of any "new" furniture, you are #1 on my list. Your furniture is awesome and loved the antiques section of your website. Thanks again for what you do! I just wanted to drop you a note to say how THRILLED I am with my new countertops. They are absolutely gorgeous and even better than I was expecting. I love the color, the wood, and most especially the "touch" -- or if they were fabric, the "hand" or the feel of the surface. I couldn't be more thrilled and am so glad you were featured on This Old House or I never would have found you or thought to use reclaimed wood. Anyway ... it was a pleasure doing business with you and I thought you might enjoy hearing how pleased I am with your wood work. Steve and Chris...we're so grateful to receive the Certificate of Authenticity. I'm going to laminate it and tape it under the table. The table is magnificent. We've been using it and absolutely loving it like a member of our family! Thank you so much for another beautiful piece of furniture! We love the desk! Well, the delivery guys just left, and the table is gorgeous!!! It fits the space perfectly, with four chairs comfortably on each side. The contours of the boards are beautiful, and the patina is terrific. My family will be so happy to finally have a proper table for Thanksgiving! I'll try to take a couple of photos of the table in place, and send them to you. You can certainly put me down as one of your very satisfied customers, and feel free to use me as a reference. Many, many thanks for all your work to make the perfect table for me. You guys are great to work with! I received the American Chestnut bowl today and am very happy with this beautiful creation. Please let Stephen know that his artistry and craftsmanship are very well appreciated and this small bowl will remain greatly treasured. Just received the wedding bowl. It is beautiful beyond what I could have hoped for. It will be difficult to give as a gift, but I believe that a gift should come from the heart. Let your husband know his work will be appreciated for years to come. Well our home here in Belle Chasse, LA has a piece of Americana history thanks to your fine craftsmanship. Our large island was delivered today and is a perfect addition to our home/kitchen . . .Having had more bad experience than goods getting things over the net, we're very pleased and happy a good, purchase experience and your site and direct service made it a pleasure . . .We and our children and grandchildren will value the piece for much time to come. THANKS! I just wanted to thank you for the table. It's beautiful and exactly what we wanted! It arrived safe and sound an we plan to have our first meal at it in about a week or so, when the addition is finished. Thanks again so much, and it was a please doing business with you. Our table arrived safely and is more beautiful than we imagined. The wood is beautiful. I love running my hand over the contours of it. The color of the legs is perfect. We're grateful for your fine craftsmanship. It has been a pleasure to do business with you. My new coffee table is sitting in front of my sofa and it is GORGEOUS!! I am trying to decide what to place on it for decoration. We will take photos of it and the other items that I mentioned earlier. 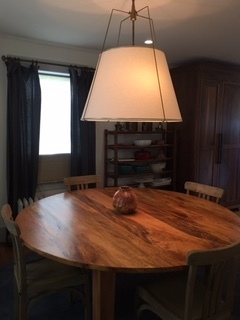 Just a note to tell you how pleased we are with our "new" chestnut farm table custom crafted by Stephen. We have just returned from our annual visit to Sanibel Island and are enjoying our new classic table. It fits perfectly with our chairs and surroundings and is just beautiful. 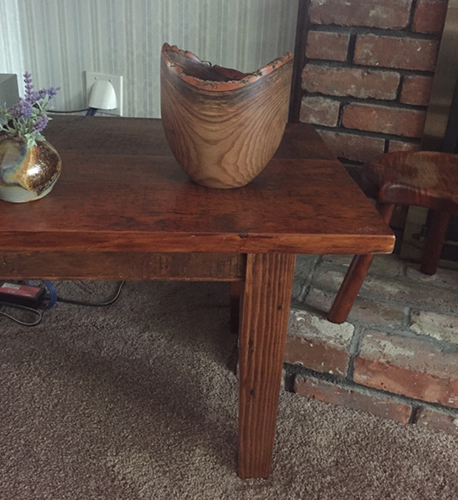 The color of the finished table is just right and shows the artist's eye of its creator. Stephen was also right about the finished table height. After living with it for a few days, I reduced the leg length by one inch to lower the table top. Its appearance and functionality are much improved. Thank you again for your patience and help in working with us. You have created a beautifully designed and crafted heirloom that we will enjoy for many years and pass down within the family. The irreplaceable chestnut from which it was made will now live on for many more years in its new form. I just wanted to write you a quick e-mail and thank you for the kitchen table and benches. The table is far more beautiful than I ever could have imagined. . .I couldn't believe how perfect it was when I saw it. It looks gorgeous in ournew house. It is the first thing you notice when you walk in and everyone is commenting on how beautiful it is. I can't stop looking at it and running my hands over it. What an incredible piece of workmanship! Thanks again for all your help with this. My husband and I and our children will cherish this for years to come. Please let us know if you want to stop by and see it in its new home. . .